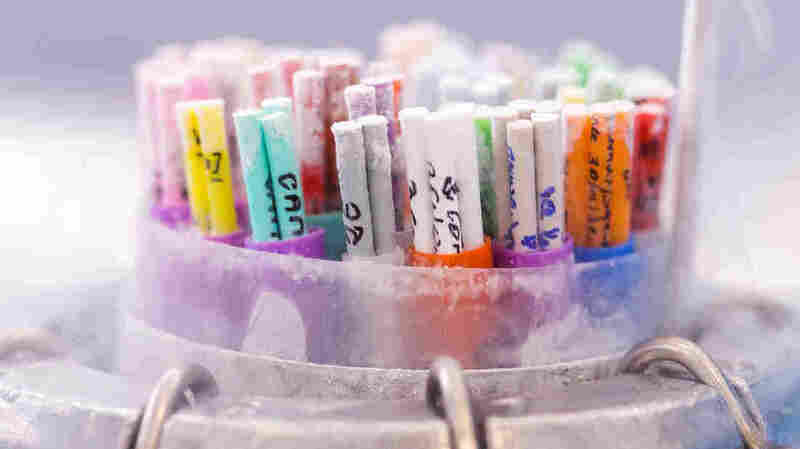 After A Divorce, What Happens To A Couple's Frozen Embryos? : Shots - Health News Former spouses who disagree over whether their embryos can be destroyed have taken their case to court. In the process, one thing has become clear: how far the law lags behind reproductive technology. Frozen sperm straws and embryos are stored in liquid nitrogen, in a process known as cryopreservation. One question confronting the courts: Should embryos such as these be treated as property, or as children subject to custody action? Soon after their wedding, Dr. Mimi Lee and Stephen Findley decided to create five embryos. Lee had just been diagnosed with breast cancer, and she worried that treatment would leave her infertile. Now that they're divorced, Lee wants to use them; Findley, however, does not. Those embryos are at the heart of a court case that will soon decide a very modern problem: Which member of a divorced couple gets control of their frozen embryos? For this San Francisco couple, at least, it would seem to be an open-and-shut case. Findley points to a clinic consent form the two of them signed, which stipulates that if the pair divorced, their embryos would be destroyed. But while a signed document might help, Judith Daar of Whittier Law School says it's not necessarily decisive. She says that courts have been all over the map on this issue — and points to one Massachusetts case in particular. "There were seven contracts in that case, because the couple had seven rounds of IVF [In Vitro Fertilization], and all of them provided that she would get the embryos," Daar says. "But in the end, the court said that it would violate the public policy of that state to force the man to become a parent against his wishes." That reasoning would favor Findley's argument — and Daar says that overall, courts have tended to side with the party who wants to avoid procreation. But Lee in this case has her own compelling argument. "My client at this point in time is 46 years old, and just simply as a matter of her age she is virtually infertile," says Peter Skinner, the attorney for Lee. "She really doesn't have any other realistic option to have a biologically related child, other than to use the embryos that she created for that very purpose." Skinner says no court has ruled against someone in that position. He also maintains that what Lee and her ex-husband signed is not a legally binding contract. The fertility clinic the couple used disagrees; it has sided with the ex-husband, whose attorneys did not respond to an interview request for this article. And there's another difficult question at work here: Is an embryo a child? Judy Sperling-Newton, the director of the American Academy of Assisted Reproductive Technology Attorneys, says that courts have struggled to provide an answer. "Whether an embryo belongs to the people who created it, as property would, as something else they would divide in a divorce," Sperling-Newton explains. "Or whether they're living beings and should be considered the way children would be considered in a custody action." Daar, the law professor, offers another solution. "The fact that technology got us into this problem is also suggestive of the fact that technology will eventually get us out of this problem," she says, suggesting that a breakthrough could spare couples the legal wrangling. It's now become possible to freeze unfertilized eggs — so, as with bank accounts, loving couples could choose to keep their gametes separate. "And if they break up," she adds, "he can have his sperm, she can have her eggs, and they can dispute other matters in the relationship." In other words, it might make matters not quite so emotionally — or legally — messy.